The thought of being able to harness free energy from the sun is very enticing. It’s better for the environment than burning coal and it can even save you a lot of money. Although the sun is bombarding the Earth with free energy every day, there is still an expense involved with buying the equipment and components it takes to collect and use that energy. So how much does solar power cost? How much money will I need to get started with and how quickly will I see a positive return on investment? The amount of money solar power is going to cost depends on a number of different factors. 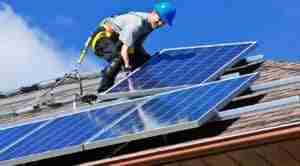 The more electricity you use, the more solar panels you will need. And if your system is going to be off grid, you’re going to need a battery bank large enough to store all of the electricity you when the sun is not shining. Needless to say, the more efficient your home is, the less solar power will cost you. If you have good insulation and you’re running energy-efficient appliances, getting started with a solar power set up will be less expensive. So to answer the question how much does solar power cost, a good place to start would be to figure out what your average energy usage is. According to the US Energy Information Administration the average household in the United States uses about 900 kWh of energy every month. To figure out what your energy usage is, you can look at your electric bills from the last six months or more and then average them out to find out what your average kilowatt hour usage is on a monthly basis. You may also be able to call your local utility company for help in figuring out what your average usage is. Once you know how much energy you use in an average month, you’ll have to figure out how many solar panels it will take to supply all of the energy you need. You’ll have to look into the average number of hours of sunlight that your area receives. When you know how much sunlight your area receives and what your average energy requirements are, you can start to calculate how many solar panels it will take to provide you with the energy you need. It’s also important to keep in mind that you will need to buy more than just solar panels. You may need to purchase batteries and you’ll certainly need to purchase things like inverters and charge controllers. To help make solar power more affordable, a lot of local governments offer tax breaks or other incentives to help offset the cost, so you’ll have to look into those types of programs as well. The most recent information we were able to find the time of this writing says that in the United States, homeowners are paying anywhere from $3 to $4 per watt to install a solar panel system, with the average price being $3.70 per watt. To get an accurate estimate of how much a solar system will cost you, you have a couple of different options. There are a number of websites that have cost calculators where you can enter information about your power consumption, the number of hours of daylight you receive, and a number of other factors, and then the computer will generate some estimates about how much you may have to pay. The most accurate way to figure out exactly how much solar power will cost you would be to get a consultation from a professional. If you’re going to hire a company to do the installation for you, they will be able to help you figure out exactly how many solar panels you need and tell you how much it’s going to cost. If you’re going to do it yourself, collecting all of the various data and then using one of the online calculators may be your best bet.